Children up to 3 years stay free of charge in the parent´s room with all inclusive services. In the evening choose from our children´s menu. For smaller children, we can organize a baby sitter (for a fee). 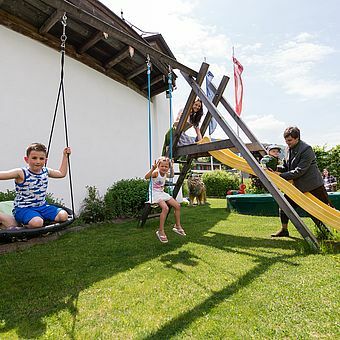 In the months July and August there is a children´s program in the village from 10:00 to 15:00 on weekdays (1 day at the mountain pasture, barbecue, horse riding etc.). In Summer: Small hikes to the Sinnlehenalm, games at the playground and in nature, splashing in the brook and much more. In Winter: The "Schanteilift" is only 100 m from the hotel. There your children will have fun with skiing, tobbogganing etc. 3 skischools offer ski lessons, skikindergarden also with lunch until the afternoon. It is important to us that children are active on a family holiday. The Leogang nature offers a wealth of possibilities. In summer there is also a great children's program from 10 am to 3 pm in the village - free of charge for guests with the LoewenAlpinCard! Leogang is known worldwide for the biggest downhill bike park in Europe. For children there is a smaller and safer version. Right next to the valley station of the Leogang cable cars is the Riders Playground. A separate lift (conveyor belt type) brings the young bikers to the starting point of the different tracks. This "playground" combines sport and adventure in nature. The course is equipped with eight wooden elements and 15 dirt obstacles. The obstacles are not higher than 50 cm, since security is prioritized. The park can be explored by very small ones with the balance bike or young people aged up to 14 years. 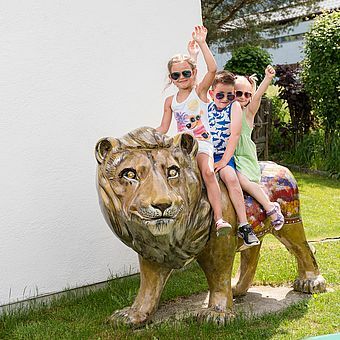 Leo's Kids area is located directly on the Asitzbahn (only 5 minutes from the hotel "Der Loewe"). Together with local ski schools, the smallest skiers can conjure their first turns into the snow. "Zauberteppiche" (conveyor belt type lifts), a children's carrousel, snow-igloos, a knight’s castle and much more provide a variety of fun experiences. With an area of ​​around 1.5 hectares and a snowmaking facility, Leo’s Kids area offers safe winter fun until spring. You can also use the free hotel shuttle to Asitz. A "skipass" is necessary for "Leo's Kids area", but in the ski circus all children up to 6 years get free admission with the Montelino ski pass. 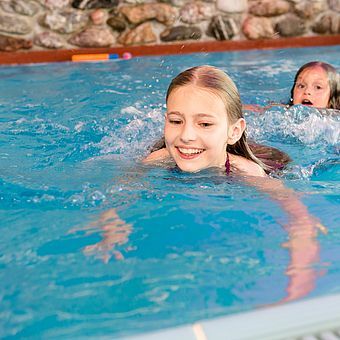 From 16 March 2019: 50% discount on children's rates in the hotel plus free ski pass for all children under 15 years of age if a parent purchases at least a 4-day ski pass. • Weekly children 's program in the village (MO - FR): For example, a day on the alp pasture, kasperl theaters, children' s face painting, hiking, barbecue, fishing, horseback riding, bread baking etc.